I came across my first paso while I was going to my rollerblading class. This one was kept in a container-looking thing and the locals all went to pay their respect to it. 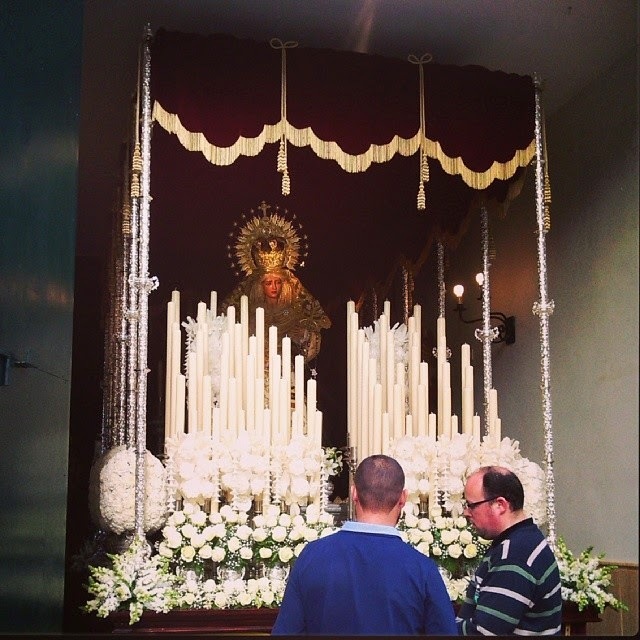 Thanks to our intercambio friend, Gastón, we found some churches which were open and took some photos from behind the Spanish who come all dressed up with their families to visit the statues, the reverence is clear on their faces. We knew the pasos will be big and elaborate but their size and beauty still took us by surprise. The face of this Virgin was cunningly lit up by the light of a well-positioned lamp. In the front of Christ’s paso there’s a wooden bit. This is used to communicate with the costaleros, the people who are inside it, carrying the whole float. These are some of the ‘less famous’ ones, although some of the Sevillanos would probably frown upon this statement. In the next blog you can read about one of the ‘big names’.